Contemporary Art Evening Sale. © Sotheby’s. 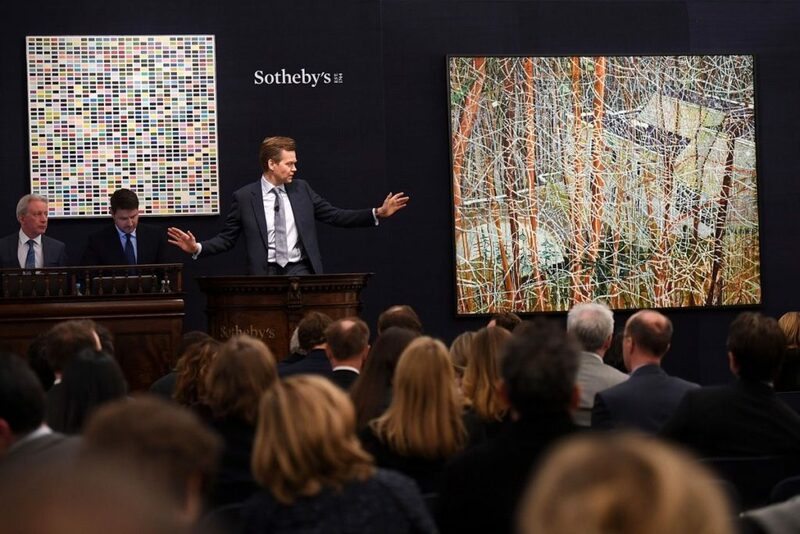 Primed with appealing and largely blue-chip offerings, the art market continued to show strength and stability at Sotheby’s Contemporary Art evening sale on Wednesday, bringing in £109.2 million after buyer’s fees with only three out of 58 lots going unsold. The tally, including fees, neared the high side of pre-sale estimates between £85,880,000 and £118,720,000; the buy-in rate by lot was a slender 5.2%. The hammer total was £93.4 million. The evening total was roughly a 7% drop from last year’s £117.4 million result, including fees. Three additional works were withdrawn just before the sale began. Twenty-seven of the 55 lots sold in Wednesday night’s auction exceeded one million pounds and of those, six hurdled the five million pound mark. Twenty-one lots—nearly 40% of the sale’s successfully sold works—were backed by financial guarantees, either in combination with Sotheby’s or solely by third-party backed “irrevocable bids,” a sign that, despite growing confidence in the market, sellers still want insurance before placing major works at auction. Outside backers receive a confidential fee from the auction house for providing the guarantee. Christopher Wool, Untitled, 2007. © Sotheby’s. The evening began on a confident note with Christopher Wool’s Untitled (2000), a riff on the color red in enamel on rice paper. Identified as part of his storied “9th Street Rundown” series, it sold to a telephone bidder for its high estimate of £600,000 (£729,000 after buyer’s fees). That was just a warm-up for a second and significantly larger Wool at 126 by 96 inches, and resembling in part the brash brush work of the Abstract Expressionist era. Untitled (2007), executed in enamel on linen, was consigned by Benedikt Taschen, the publishing magnate and noted contemporary art collector. The Wool ignited a fierce and drawn-out bidding battle in the salesroom before finally selling to New York’s Andrew Fabricant of Richard Gray Gallery for a sizzling £9.1 million (£10.4 million with fees), well above the high estimate of £6.2 million. Bidding opened at £3.7 million and almost instantly started a bidding ping-pong match between Fabricant and the New York-based private dealer Philippe Ségalot, with each volley across the net nudging the price up in £100,000 increments. The dealers bid on behalf of their clients from opposite ends of the salesroom, each with a cell phone glued to an ear. A bit later in the sale, Fabricant was observed amiably chatting with Ségalot. After all, it is an art club. The seasoned dealer pointed out that another Wool from that small group of monochromatic, large-scale works sold at Sotheby’s London a year ago for £7.1 million. Another version resides at Tate Modern. In any case, the bidding duel proved to be the high point of the evening. 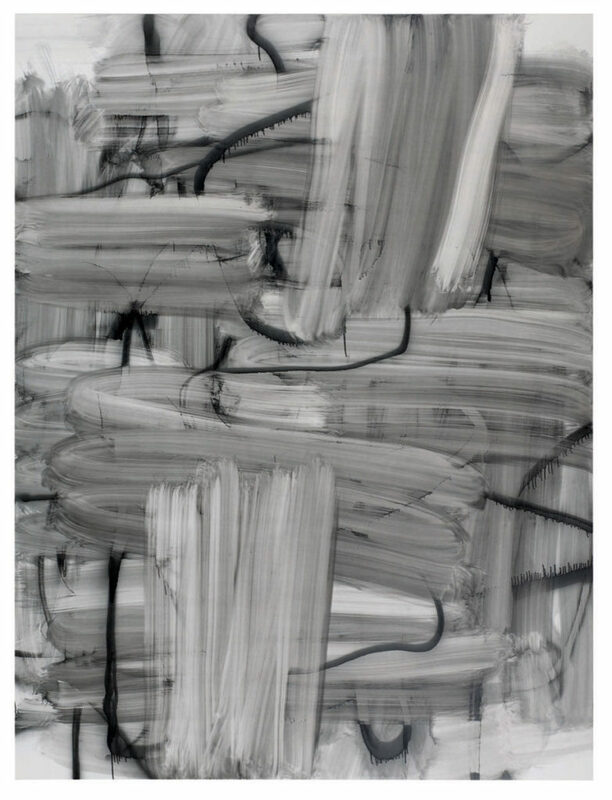 Untitled (1994), Albert Oehlen’s rousing and Expressionist-style abstraction in oil and silver paint on canvas composition, and resembling a Willem de Kooning painting on steroids, sold for £1.6 million (£1.9 million with fees), just above its high estimate of £1.5 million. It came to market with an irrevocable bid, and last sold at Sotheby’s New York in May 2012 for $722,500, a record for the artist at the time. Works on paper entered the evening mix with Jean-Michel Basquiat’s halo-capped figure in acrylic and oil stick, Untitled (Figure JMB #1) from 1982, which sold without much ado for £2.2 million (£2.6 million with fees), below its low estimate of £2.4 million. The anonymous seller acquired the work at Sotheby’s New York in November 1998 for $79,500, proving investor Warren Buffett’s mantra of “buy and hold,” although Basquiat’s recent prices make him a “value stock” for a very select few. Gerhard Richter, 1025 Farben, 1974. © Sotheby’s. The stakes climbed with Gerhard Richter’s color-charged early abstraction Wind (1982), which sold just above its low estimate for £2.6 million (or £3 million with buyer’s premium). 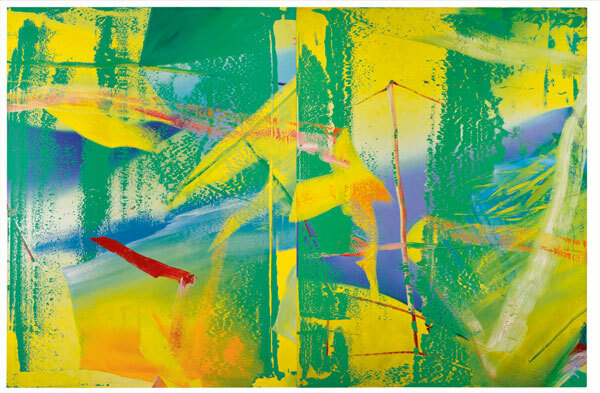 The significantly larger and more ambitious two-part Richter abstraction, Gelbgrün (Yellow-Green) (1982)—which exhibited at documenta 7 in Kassel, Germany, that same year, as well as in the artist’s acclaimed “Panorama” retrospective at Tate Modern in 2011—sold to a telephone bidder for £9.5 million, near its high estimate of £10 million, and came to £10.8 million with fees. It was Gelbgrün (Yellow-Green)’s first appearance at auction. 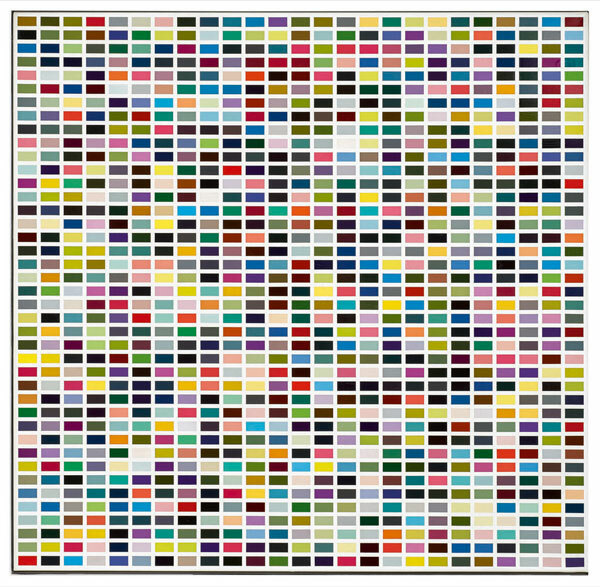 A third Richter offering, 1025 Farben (1974)—popularly known as one of his Color Chart paintings, miming that of a paint store’s color chart display—sold to Brett Gorvy of New York and London’s Lévy Gorvy for £6.4 million (£7.3 million with fees), squarely within its £5 million to £7 million estimate. Nicholas Maclean of the New York and London-based art advisory Eykyn Maclean was the underbidder in the evening’s second shootout. The lacquer-on-canvas work last sold at auction at Sotheby’s New York in May 2008 for $4 million. Both 1025 Farben and Wind carried irrevocable bids. Peter Doig, The Architect’s Home in the Ravine, 1991. © Sotheby’s. 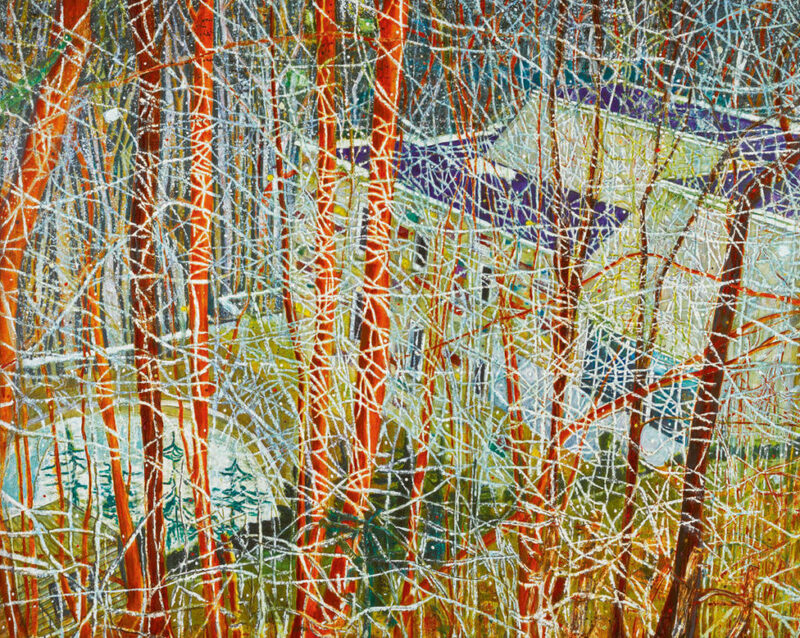 Other high-value lots included the cover offering, Peter Doig’s signature and critically acclaimed The Architect’s Home in the Ravine (1991), which, despite being the highest-priced lot in the sale, went with hardly any competition to a telephone bidder for £13.2 million, or £14.3 million with fees, underperforming its £14 million low estimate. It had come up to auction four times since its first appearance in 2002, most recently in February 2016 at Christie’s London when it made £11.2 million. Tonight was its fifth time around. The 78-by-98-inch oil-on-canvas depicts a Modernist-style house in the woods, but seen through the blurry, all-over pattern of a raging snow storm, making it appear as a stunning matrix of interwoven white markings. While the house resembles that of a suburban house in the wealthy enclave of Rosedale in Toronto, it also relates to Le Corbusier’s iconic Unité d’Habitation building in Briey-en-Forêt, France, which Doig visited in the summer of 1991, according to the catalogue entry. It didn’t come close to Rosedale, a related and similarly scaled work by Doig from the same year that sold for a record $28.8 million at Phillips New York in May. The current offering, and luckily so, was backed by an eleventh-hour irrevocable bid announced just before the auction began. Large landscapes provided other market scenery at Sotheby’s as Rudolf Stingel’s massive and photorealistic mountain view from the Tyrolean Alps, Untitled (2009), executed in oil on canvas, came in at its low estimate of £4 million, or £4.6 million with fees. The surface, though painted, resembles a vintage and somewhat scuffed gelatin silver print, and is, in effect, an enhanced photograph of a photograph. The anonymous seller acquired the work from Gagosian Gallery in 2014. Gerhard Richter, Gelbgrün (Yellow-Green), 1982. © Sotheby’s. One of the handful of casualties that failed to sell was David Hockney’s boisterously cheerful and widely exhibited Different Kinds of Water Pouring into a Swimming Pool, Santa Monica (1965), executed in acrylic on canvas, which flopped at a chandelier (as in, imaginary) bid of £4.5 million. It had last sold at Sotheby’s New York in May 1989 for $506,000. Another British entry, Antony Gormley’s half-life-size bronze figure Angel of the North from 1997 (number six from an edition of 12, plus one artist’s proof), had better luck, surpassing its £2 million high estimate to sell for £2.4 million, or £2.8 million with buyer’s fees. The figure, based on the cast of the artist’s body with spread wings resembling the wooden struts of an early biplane, last sold at Sotheby’s New York in May 2014 for $1.6 million. It is a distant relation to Gormley’s giant outdoor sculpture of the same title in Gateshead in Northern England. Andy Warhol, Hammer and Sickle, 1976. © Sotheby’s. 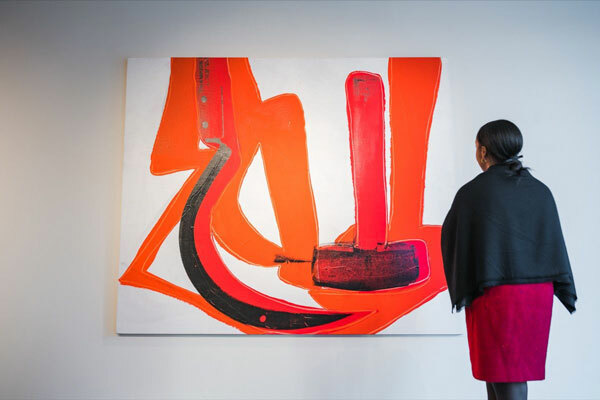 While American Pop Art entries were scarce, Andy Warhol’s graphically imposing and large-scale Hammer and Sickle (1976), playing on the now-fading red symbol of the Communist movement developed during the Russian Revolution and set against a white background, sold to another telephone bidder for £3 million, or £3.5 million after fees, right in the middle of its estimate range. It was backed by an irrevocable bid. On the Italian front, Amanti (Lovers) (1962–66), an early and surprisingly pristine Michelangelo Pistoletto mirror painting, or “Quadri Specchiati,” went for a slightly underperforming £2.2 million (£2.6 million with fees). Pistoletto painted an embracing couple in photorealistic detail on tissue paper on polished stainless steel, and the seller had acquired it a half-century ago in 1968 from the legendary Ileana Sonnabend Gallery in Paris. It was backed by another irrevocable bid. Figura Femminile con Fiori (Female Figure with Flowers), an early and massive polychrome ceramic work by Lucio Fontana from 1948 (pre-dating his famed and prolific “Concetto Spaziale” series of the 1960s), sold at its low estimate of £1.5 million, or £1.8 million with fees. It had last sold at Sotheby’s London in October 2010 for £914,850. But that number paled next to Concetto Spaziale, Attese (1963), a Ferrari-red Fontana bearing six vertical cuts, which launched a bidding battle that ended with a victorious telephone bid of £4.3 million (£5 million with fees), well above its £3 million high estimate. It last sold at Sotheby’s London in March 1995 for £84,000. The evening’s last entry, Cindy Sherman’s widely exhibited Untitled Film Still #57 (1980), one of a small edition of three gelatin silver prints, sold for £180,000 (£225,000 with fees), below its £200,000 low estimate and a modest price point for a museum-quality work. It had been included in the artist’s traveling retrospective that began at the Museum of Modern Art in 2012, and is one of 70 works from the famed series. It last sold at auction at Phillips de Pury & Company, New York, in November 2005 for $60,000. All prices reported include the hammer price and the result with the tacked-on buyer’s premium, calculated at 25% of the hammer price up to and including £180,000, 20% of any amount above that and up to and including £2 million and 12.9% for any sum above that figure. Estimates do not reflect the buyer’s premium. The evening sale contemporary action resumes at Philips on Thursday. This entry was posted in Auctions and tagged Albert Oehlen, Andy Warhol, Antony Gormley, Christopher Wool, Cindy Sherman, Concetto Spaziale, David Hockney, Gerhard Richter, Jean-Michel Basquiat, Le Corbusier, Levy Gorvy, Lucio Fontana, Michelangelo Pistoletto, Peter Doig, Sotheby’s, Willem de Kooning. Bookmark the permalink.